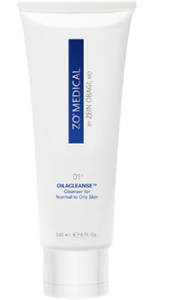 Elena’s Medi spa is proud to be a licensed retailer of the medical skin care line Zo Medical. Elena offers two facial peels by Dr. Obagi. here. Eye Brightening Repair Crème This breakthrough multi-function formula is designed to both correct and prevent multiple signs of aging on the delicate skin of the eyes. Active Vitamin A and biomimetic proteins encourage natural collagen production to help restore skin’s elasticity. Enzymatic vasodilators, caffeine and coenzyme A rapidly reduce puffiness. Skin’s appearance is instantly firmed and smoothed. The ZO® GSR™: Getting Skin Ready system will optimize the effectiveness of your ZO® treatment program and is the first step in your protocol. This basic system includes three products; a cleanser, scrub and oil control pads. FOAMACLEANSE™ Gentle Foaming Cleanser for All Skin Types 60 mL / 2 Fl. Oz. Cleanse your face twice a day to remove impurities, and refresh and revive skin. VITASCRUB™ Invigorating Foaming Scrub Net Wt. 56.5 g / 2 Oz. Scrub your skin once a day or less frequently as desired to remove buildup and activate skin cells. 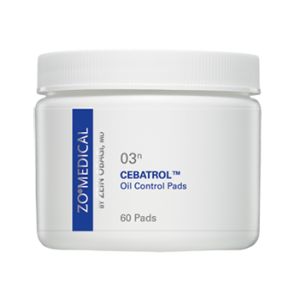 CEBATROL™ Oil Control Pads 60 Pads, 75 mL / 2.5 Fl. Oz. Oil control is one of the best ways to fight aging, breakouts, and keep skin healthy and vital. Use twice a day. Designed by Zein Obagi, MD to treat several skin conditions: Hyperpigmentation. Treat moderate to severe hyperpigmentation, especially melasma. Recommended as a starting point for treating melasma. Severe Texture Damage. Treat severely dry, dull, rough and leathery textured skin to help soften skin and restore a smooth, healthy glow. Sun Damage. Treat severely dry, dull, leathery textures with visible sun spots and damage. Pre/Post Procedure Skin Conditioning. Start on this system 4-6 weeks before office procedures, and use for 12 weeks afterwards for improved patient outcomes and longer lasting results. General Skin Health Restoration. 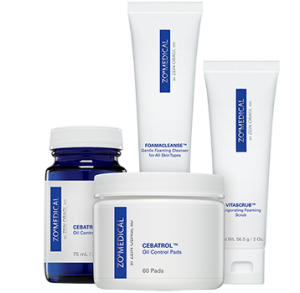 Use this system to improve the overall quality, health and appearance of the skin. 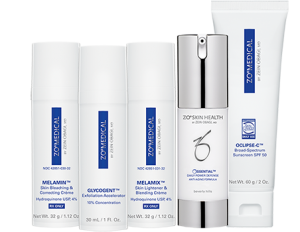 For more information on Zo Medical Skin care line visit their website at ZoSkinHealth.ca Please contact Elena for more information on the Zo Skin care line for purchase.